Try this over whole wheat toast with nut butter or to thicken fall soups. You won't believe we didn't add any sugar! Try this over whole wheat toast with nut butter or to thicken fall soups. You won't believe we didn't add any sugar! 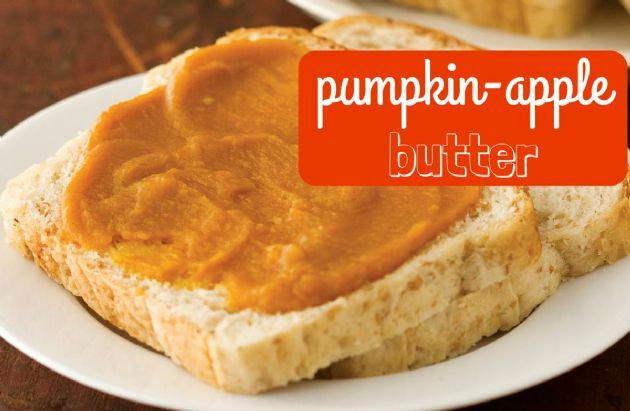 Try this on acorn squash, too! Give away small canning jars of pumpkin butter as gifts. Due to the low acid in the pumpkin, it is not suitable for canning. Place a label on the jar with the date made. Note that it will keep in the refrigerator for one week or up to three months in the freezer. Be sure to use pumpkin puree, not pumpkin pie mix, which contains spices and sugar. Place all ingredients in a lidded saucepan. Cover and simmer over moderate heat for 10 minutes. Remove the lid and cook for an additional 20 minutes. Stir frequently, as the mixture gets quite thick. Puree with an immersion blender or in a food processor. Pour into canning jars or sealed containers. Refrigerate until chilled. Makes 3 cups, 2 tablespoons per serving.